They may be simple but looks so beautiful, i love the mixed colors as well. I love these photos. Your composition brings such colorful life to them! They are "happy" flowers! 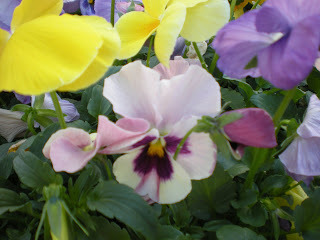 Very pretty pansies! They are such cheery little flowers! And I love the nature sounds in the background too! The whole thing makes me very anxious for spring! Great job! To me pansies mean spring is finally here. But they won;t be in my gardens till mid April so I'll enjoy yours. they make me warm and happy, thinking of summer. I love their colors. 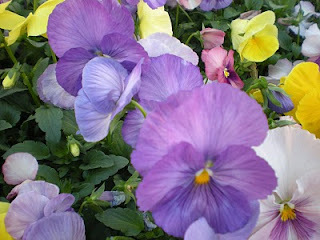 These are lovely pansies! I love the way they are such different combinations of colours! Your top pansy photo is just like a painting. I want to touch it!